Chelsea defender Antonio Rudiger is set to miss the Europa League quarter-final second leg against Slavia Prague with a minor knee injury picked up in Sunday’s defeat by Liverpool. 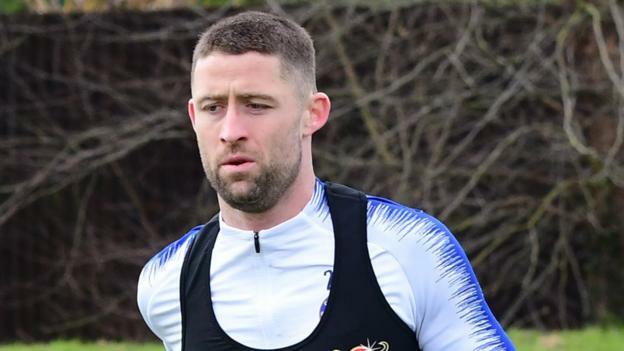 Gary Cahill, whose last appearance was in November’s win over PAOK Salonika, could be on the bench in his absence. Midfielder Ethan Ampadu and defender Marcos Alonso are both doubts. Olivier Giroud could start up front, as he did in Chelsea’s 1-0 first-leg victory in Prague. David Luiz is likely to be partnered by Andreas Christensen in the centre of defence. Should they progress Chelsea will face either Benfica or Eintracht Frankfurt in the semi-finals. The Portuguese side lead 4-2 after their home leg. Chelsea are unbeaten in their last 14 games in the Europa League. Of the 10 European quarter-finals they have contested since 2003-04 they have progressed from all except a Champions League defeat by Manchester United in 2011. Chelsea’s only previous European meeting with Slavia Prague was their 1-0 first leg victory. Chelsea have won 10 of their 11 Europa League matches this season (W10 D1 L0) – no English side has ever won 11 major European games in a single season (also Man Utd in 2002-03/2016-17 and Newcastle United in 2004-05 on 10 wins). Slavia Prague have overturned a first leg deficit on four of the 12 occasions this has occurred in major European competition, although they have been eliminated on all four occasions they’ve lost the first leg at home. Willian has provided seven Europa League assists for Chelsea this season, the joint-most in the competition along with Bate’s Igor Stasevich.